I read this article and found it very interesting, thought it might be something for you. The article is called Kinsa Smart Thermometer Takes Grand Prize in Innovate Health Tech and is located at https://hitconsultant.net/2013/07/23/kinsa-smart-thermometer-takes-grand-prize-in-innovate-health-tech/. Kinsa Smart Thermometer was announced today as the $25k grand prize winner in Innovate Health Tech NYC, a competition designed to promote innovation within NYC’s health technology sector. The competition is an initiative of New York City Economic Development Corporation (NYCEDC) sponsored by Janssen Healthcare Innovation (JHI) that recognizes early-stage health technology companies and entrepreneurs tackling pressing issues affecting human health. The winning startup was selected out of ten finalists that met at WeWork Lounge in NYC on July 10th to pitch their pre-commercial, prototype stage technologies to a panel of expert judges and 150 members of the healthcare and tech communities. Oculogica took second place ($15,000) for their unique eye tracking technology that unveils how well the brain is functioning followed by AdhereTech in third place ($10,000) for their patented wireless pill bottles that improve medication adherence. Kinsa, an early stage digital health startup is creating the world’s first real-time map of human health. The startup’s first product, the Kinsa Smart Thermometer is a smartphone-connected thermometer that helps users track their illness history, share that with physicians, manage and plan around their illness, and view the “health weather” in their local area. The Kinsa Smart Thermometer itself has no batteries, LCD, or processor, instead leveraging the power of the smartphone to allow the device to be thin, flexible, and comfortable to use, especially for children. 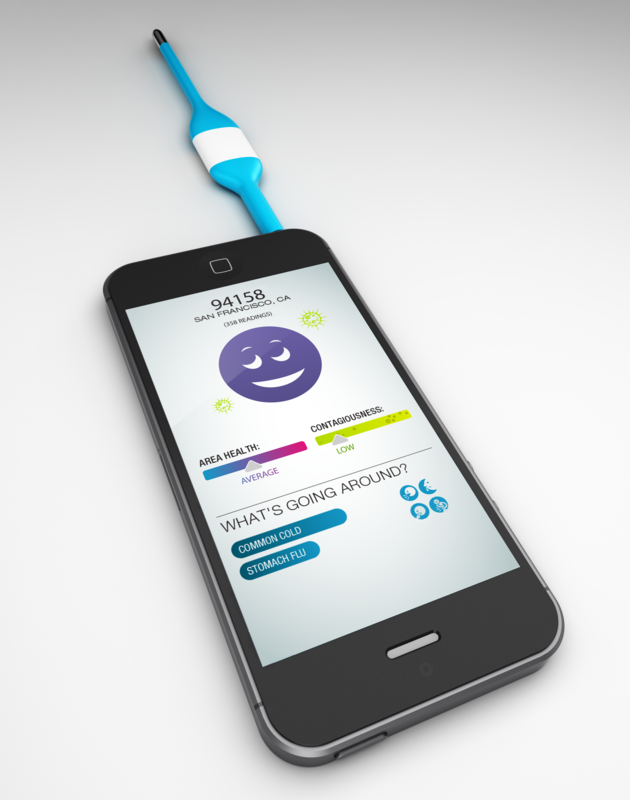 The thermometer connects to the phone via the headphone jack, keeping its cost far lower than the costs of other existing mobile-connected medical devices. The price point for the device is on par to be cheaper than most current non-connected thermometers. To generate more buzz as well as raise funding, the startup launched a successful crowdfunding campaign on Indiegogo on April 17th raising a total of $52k in addition to the $2 million in seed funding. Kinsa’s long term vision is on widespread access to better health information. « Should the DoD Buy Epic, or Cerner, or GE, or…?